A sign on the door at Forest Books urges patrons to sign a petition to save the store. After nearly a quarter-century on 16th St. near Valencia, the store’s rent has gone up by 300 percent. Rising rents may soon write the final chapter in the story of two vintage bookstores after more than 20 years of book sales on 16th Street. By year’s end the landmark shops, Adobe Books and Forest Books, which jointly house more than 45,000 used volumes, could vanish from the Mission’s literary scene as pressures from gentrification and e-book sales squeeze out independent booksellers. “The book business is not as healthy as it once was,” said Adobe’s owner, Andrew McKinley. “People don’t accumulate libraries like they used to.” Without commercial rent control, San Francisco landlords can raise rents at will if a shop isn’t under lease. “We’ve paid a low rent,” McKinley said, but now he faces a 50 percent increase. “A new landlord and the hotness of the Mission have combined to push us out.” The property management firm for McKinley’s landlord did not return calls seeking comment. “Bookstores dignify a neighborhood,” said Jakushū Gregory Wood, the 63-year-old Soto Zen monk who opened Forest Books in 1989. The shop may close at year’s end rather than pay triple its current rent. “The whole point of the store is to create a space for peace and a contemplative atmosphere,” said Wood, who wears small spectacles and keeps his gray hair close-cropped. Walking into Forest Books, customers are greeted by the smell of incense. A fountain bubbles near the register and chimes ring when a customer comes or goes. Prayer flags hang near the entrance. Custom-built shelves line the walls and create wide aisles where readers browse books with subjects ranging from Taoism to contemporary literature. Despite his peacable monk’s demeanor, Wood is waging a fierce fight to save Forest Books. 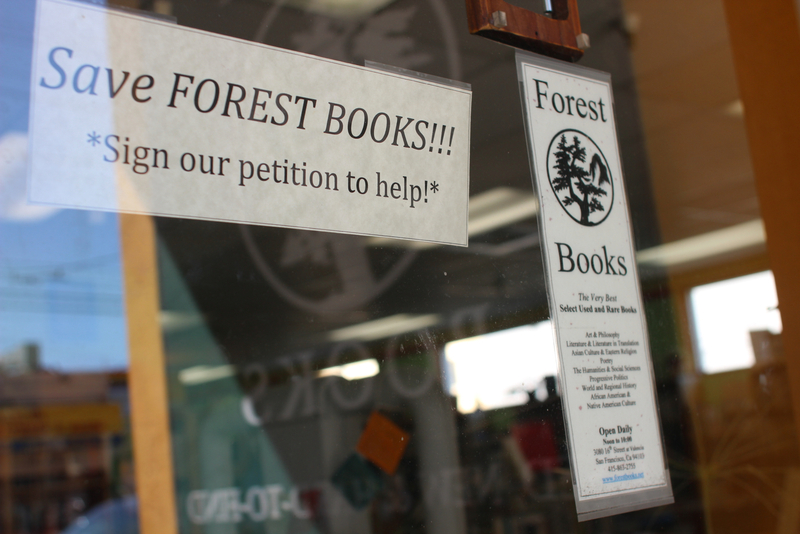 A red-lettered petition reads: “Forest Books is being forced to close its doors! After 23 years in this location our greedy landlord, Mission Housing Development Corporation, has raised our rent 300 percent!” He’s gathered more than 100 signatures so far. An 80-year-old Forest Books customer who gave his name as Edward was browsing the translations section for works from Scandinavia. “They have a very interesting collection of books, and a good selection of translations from different countries,” he said. Forest Books’ landlord, Mission Housing Development Corporation (MHDC), is a nonprofit organization that owns about 30 buildings in the Mission and also provides low-income housing and services to more than 1,000 families, according to its president and CEO Larry Del Carlo. “We don’t want Forest Books to leave,” Del Carlo said. But in order to continue to provide its services, MHDC must raise below-market rents on its commercial properties to market level, he said. Grant money that MHDC formerly received has dried up, forcing a shift as the Mission becomes more popular. MHDC offered Wood a gradual increase, Del Carlo said, beginning with a 50 percent hike this year and more than tripling to a market rate of $3.38 per square foot in 2016. “I might be able to handle a 10 to 15 percent increase over that period, but 300 percent is just inconceivable,” Wood said. Wood rejected the gradual plan and received a letter from MHDC in July saying that his rent would be $3 per square foot effective September 2012, he said. Del Carlo asserts that the conversation is still open. Originally, Wood said, his lease was for 40 years, with five-year options to renew. Currently Forest Books is on a month-to-month basis, something Wood said he wasn’t told about until it was too late. Even the shop’s size is in dispute: Wood said that MHDC is trying to charge him for 1,876 square feet when his original lease said 1,792 square feet. McKinley of Adobe Books agreed that gentrification is driving his rent hike. Adobe has its own distinct vibe. Narrow aisles are cluttered with novels, art books, chairs and couches. In the back is a small gallery. It’s not uncommon to find regular visitors sleeping in the afternoons. Up front, Willie Nelson’s voice resonates softly over the speakers. The owner has to squeeze through tight spaces and step over boxes to answer the phone. Clad in green corduroy pants and maroon sweatshirt, the 55-year-old McKinley recalled the old Mission. “It was affordable, it was human and it had some foot traffic. There was a real bohemian element,” he said. That sense of community fostered by the bookstores also helped make the Mission a magnet for the commercial forces now driving them out. The shop’s regulars are bracing for the loss. “It’s a people place for me,” said Adobe customer J. Lee, 42. “It’s really too bad about the closing.” Lee said he’s been stopping into Adobe about twice a week for the last 12 years to hang out, socialize or write poetry. “It’s the remnants of the bohemian Mission,” Lee said. “This is an institution. A mental institution, sometimes,” he joked. “Maybe small businesses are doomed. The old way of doing business here is getting kicked out,” said McKinley, who is reassessing his business model. Among the possible rescue strategies for Adobe is a plan to turn the store into a cooperative, with customers paying to be members. McKinley envisions crowd-funding providing enough to keep the store afloat while changes are implemented. “Adobe has until the end of the year to get its act together,” he said. Barring a reprieve, both shop owners say they may have to put their stock in storage and start selling books online, or even move. That’s a step neither relishes; both would prefer to stay put. “This is where we’re gonna make our stand,” McKinley said. Okay, Adobe Books- I never thought they were a functioning book store, really, But Forest Books absolutely is. But what are you going to do? You can’t force people to purchase books. And these are, after all, commercial spaces…I would rather have a bookstore than another coffee shop, certainly (or a bar..gack). But bookstores are for profit entities…they aren’t community service spaces. How about relocating to lower 24th street? There are a couple great spots open for rent right now, and it is much cheaper than 16th/valencia area. Other bookstores have moved in to the area, so it could be a real concentrated draw to have more bookstores which draw folks from around the city. And they are right — bookstores help improve a neighborhood — I would love to have Forest Books near by! Very sad when bookstores move out of a neighbhorhood. Move down into Mission St going into the Bernal Heights area. A bookstore would be a vast improvement to the junk that is there. Also, it would be a great addition to the neighbhorhood. Maybe the 2 bookstore owners could combine their resources & open a shop together. The endangered SF that I love is like a rainforest ecosystem – a collection of highly diverse creatures living in a bewildering range of ways. These big, small, ugly, beautiful, flying and burrowing creatures coexist in a chaos of competition and cooperation that somehow (mostly) works. It’s a REAL city, full of the contrasts that help us understand reality. Side by side there are smarts and stupids, rich and poor, old wood and new glass, marketing-driven and heart-driven, newcomers and old timers. Every race, every age, every hairstyle, every kind of hair-brained project. This is all sometimes called being a “hip” city. If you’ve experienced the sad and lonely car-based corporate strip mall / tech-bunker desolation of the southbay, it will come as no surprise that tech workers prefer to live and work in SF. These comparatively wealthy computer programmers are not a bad bunch – whip smart, well mannered and hard working. But thier numbers and deep pockets, fully in conjunction with landlord opportunism, have driven rents, commercial and domestic, through the roof. This is creating a crisis: the transition from rainforest to monoculture. sanitary playground of rich techies with a minor in expensive food eating will destroy what made the city attractive in the first place. The solution is an immediate and draconian system of commercial rent and usage controls, with the aim of maintaining a reasonable variety of space usages. Not everything positive in life generates huge profits. Your kids and pets don’t. Your flower garden doesn’t. And funky used book stores like Adobe don’t. Some things are not about profit. And other things need a low-rent incubation before they become about profit. And it is precisely these things which elevate a “hip” city above a strip mall. biologist’s comment is incredible! thanks for your analogy – very poetic and on point. What a lot of articles like this miss is that book stores also foster an entire ecosystem of social activity, although it was alluded to in the quote about corporate owned stores not connecting to the community. In my mind that is a key issue, one that is hard to quantify but has real world effects nonetheless. After all, how many people hang out at cell phone stores? One of the keys to sustainability of a Mom & Pop business in popular locations is owning the real estate. The owner of Adobe often mentions the fact that he should have made an attempt to buy the building when 16th Street was a less desirable location. Perhaps a collective of like minded people, committed to creating a sustainable bookstore, can pool their resources and buy a building in Oakland, Bayview or the Outer Mission. After 10 or so years, their place in the community will be secure. This. This is what I’ve been trying to get across. We have to *invest* in our communities, and that doesn’t just mean buying a coffee from our local cafés. It means buying the *property*. It’s not the “yuppies” who are displacing people and altering the landscapes of our neighborhoods, it’s the property owners, the landlords, the people that are in charge of where we live and where we shop. They get to say who stays or goes. So glad you said it, Tom! it’s too bad that this Mission Housing Develpment Corp doesn’t see it this way. after all, the nonprofit sounds like it’s trying to do something to for the community; unfortunately its charter is limited to the financial sphere, rather than considering the whole picture. I agree, and I think it’s worthwhile for business being kicked out of San Francisco due to the unsustainable cost of real estate should seriously consider coming out to Oakland. There is an incredible entrepreneurial and artistic energy happening here right now, and things are still reasonably affordable in the burgeoning neighborhoods. I love the idea of a collective of people committed to building sustainable neighborhoods buying property. I wonder how that could work. Buying used books online is a main culprit. If they start taxing the online realtors (which indeed they are starting), this could make a difference in keeping these moms and pops open.